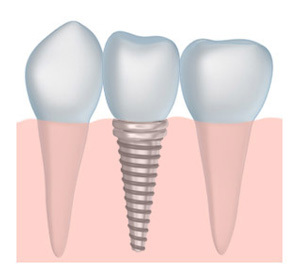 A dental implant is a synthetic tooth root made from a special titanium alloy. Dentists can use a tooth implant to replace a missing tooth. When combined with a beautiful, porcelain crown, a tooth implant can be a perfect tooth replacement. Artificial teeth created with dental implants look and feel completely natural. They fill the gap and give patients a fully functional smile again while they help a patient maintain the health of their jawbone. Other tooth replacement options fill the gap, but don’t replace the tooth root. When the tooth root isn’t replaced, the jawbone underneath the gums starts to deteriorate. When the bone deteriorates it can give the skin around the jaw the haggard-looking appearance that is typically associated with traditional dentures. Because dental implants are made with a special titanium alloy, they fuse directly with the bone and give your jawbone similar support provided by your natural tooth roots. At our practice, Dr. McCormick offers professional implant dentistry and implant restorations. A tooth implant is durable and may last a lifetime. At Bozeman Dentistry, we have the tools and skills necessary to add the restoration to your implant. We place custom porcelain crowns, bridges, and dentures on top of the dental implant to give you a beautiful, natural looking smile. If you need an implant placed, our practice works with an oral surgeon who can place dental implants for patients who are missing teeth. The dental implant procedure takes three to six months to heal, but the results are worth it. 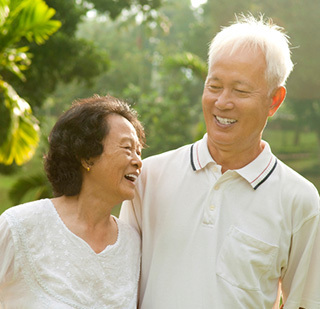 Patients with dental implants enjoy all the same benefits provided by their natural teeth. You will be able to chew, smile, and speak comfortably again. To find out more about dental implants in the Bozeman – Belgrade MT area, contact us at our office. We would be happy to consult with you and help answer any questions you have about implant dentistry. Call us today to schedule an appointment.